Partly cloudy skies this morning will become overcast during the afternoon. A stray shower or thunderstorm is possible. High around 80F. Winds SSE at 15 to 25 mph..
Variably cloudy with scattered thunderstorms. Low around 55F. Winds SSE at 10 to 20 mph. Chance of rain 60%. With El Niño winter storms routinely converging on the Plains this winter, farmers and ranchers are eagerly waiting for springtime weather. 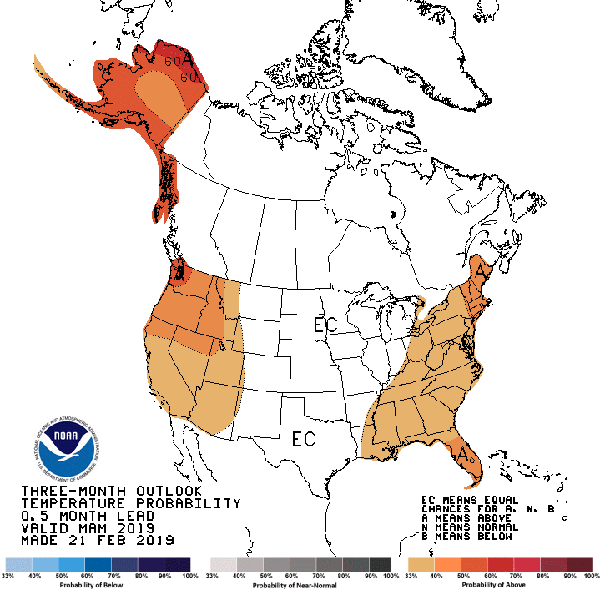 The Climate Prediction Center recently released its forecast for March through May 2019, which is highlighted by an El Niño status change. “The (previous) El Niño ‘Watch’ is now an Advisory, as weak El Niño conditions have a 55 percent chance (instead of the previous 80 percent chance) of continuing through this spring,” said Matthew Rosencrans, head of Forecast Operations for Climate Prediction Center, College Park, Md. Associated with the jet stream shifting further south into southern California and moving eastward to the central Plains, El Niño increased winter precipitation in its path. Meanwhile, the cold spell is forecast to continue into March. “March will likely delay the ‘feel of spring’ with temperatures expected to be below normal on average, although odds favor closer to normal or possibly above normal temperatures into April and May,” observed Michael Moritz, Warning Coordination meteorologist at the NWS in Hastings, Neb. Much of the region has seen a wet fall and winter, both in terms of snow and rain. “Frost depths are about average, but snow cover is a bit more widespread than normal,” Moritz said. “It’s likely it will take time for wet conditions to dry, and the colder late winter temperatures to warm, both of which could delay spring field work. However, he added grass conditions should be favorable for much of the central Plains once it warms up, given the run of wet weather the past several months. A Nebraska climatologist agrees, a wet spring start appears in store for the cornhusker state. “With El Niño-like conditions expected through this spring, we should continue to see the southern jet contribute to above normal precipitation south of the I-80 corridor (western corn belt: Nebraska, Kansas, Oklahoma, Texas,) as well as Missouri, Iowa, southern Minnesota into the mid-Atlantic region,” said Allen Dutcher, associate state climatologist for the Nebraska State Climate Office in Lincoln, Neb. Dutcher forecasts this trend will continue through much of March as the northern jet has become a bigger player during the second half of the winter. A Kansas meteorologist expects the sunflower state to begin its spring on the cold side. “There’s decent confidence that much of Kansas will remain below average (colder) into mid-March. 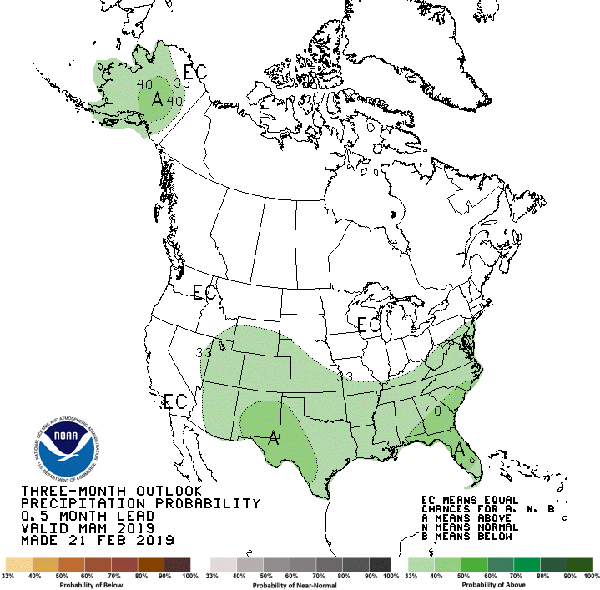 However, into April and May there’s little confidence to support either a warmer or colder than average forecast (meaning ‘equal chances),’” said Chad Omitt, Warning Coordination meteorologist at the National Weather Service, Topeka, Kan.